Microsoft Office's iPad apps have been well received since their first release in March this year – other than the annoyance of needing a suitable Office 365 subscription to use the apps for more than just viewing documents. Now that bugbear has been banished: the updated versions require only a Microsoft account to enable users to create and edit documents in Word, Excel and PowerPoint. That said, if you want the “full experience”, as the company puts it, you will still need an Office 365 subscription. What’s the difference? In Word, premium features include tracking changes, inserting section breaks, creating a multi-column layout, changing page orientation, inserting WordArt, add custom colours to shapes, adding and modifying chart elements, and highlighting tables. 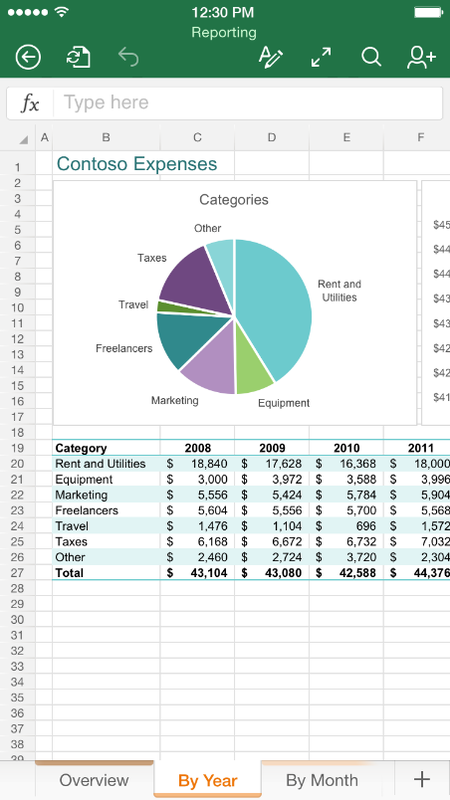 Excel users will need a subscription to customize PivotTable styles, add custom colours to shapes, work with WordArt, or modify chart elements. PowerPoint premium features include checking speaker notes in presenter view (the lack of which could be a big annoyance), and similar restrictions as Word for WordArt, shapes, chart elements and tables. That is not a long list though, and the rest of Office for iPad is available to everyone. Microsoft is gambling that promoting wider use of Office and Office 365 will be of more value than any sales lost to users who might no longer buy Office because the tablet versions meet their needs. There are also new features in the Office apps. Dropbox support has been added throughout, in line with the recently announced partnership between Dropbox and Microsoft. Chart customization is also available in all the apps, as a premium feature. PowerPoint gets the ability to add and edit animations, and zoom support in presenter view. Microsoft has also brought Office to the iPhone and iPod Touch, and a version for Android is in limited preview, with users invited to sign up to participate. That’s all tablet and smartphone users accounted for, then. But wait: what about Windows 8 users, who still lack a true touch-friendly version of Office; and Windows Phone customers, who now have a version of Office that is far behind that for the iPhone? Microsoft says, “We will deliver touch-optimized Office apps for Windows with Windows 10,” though it is not yet clear whether this will be a “universal app” that runs on Windows Phone as well as on tablets. The company is under the same pressures as everyone else when it comes to mobile support; that means prioritising iOS first, Android next, and its own tablets and smartphones last, even though it risks undermining its mobile device efforts.